The two-week bombing campaign in Yemen led by Saudi Arabia has already claimed hundreds of lives with no end in sight. Spearheading it is Mohammed bin Salman, the son of King Salman, a 34-year-old defense minister with no previous military experience. Saudi Arabia launched its military campaign in bordering Yemen after the country’s president was ousted from power by Shia Houthi rebels and fled to Riyadh. Mohammed bin Salman was appointed defense minister by his father just after he became Saudi Arabia’s new monarch in January. He now also acts as chief of royal protocol and chair of the country’s economic development council, having a say on the national budget. Mohammed, the youngest minister in Saudi Arabia and the world’s youngest defense minister, has a degree in law and experience in corporate governance. He started working alongside his father in 2009, when he was the governor of Riyadh province. His father’s predecessor as defense minister, Sultan bin Abdulaziz, was also 34 when he took the job in 1963. Mohammed bin Salman has even less military training than Sultan did when he took command of the Saudi army. Nevertheless his role sending Saudi bombers across the border is fuelling his popularity across the Sunni Arab world. His Facebook page has thousands of followers and social media are reposting the images of Prince Mohammed in his war room and posters of him defeating Saudi Arabia’s enemies. An Arabic-language hashtag on Twitter advocates calling him the Person of the Year for 2015, with thousands of retweets. The fad mirrors the fascination with his half-brother, trained military pilot Khalid bin Salman, who became an internet star in the West in September 2014. At the time the US launched a coalition bombing campaign against the militant group Islamic State in Iraq, and the pictures of the Saudi prince sitting in the cockpit of a Tornado jet sparked speculations that he may be personally bombing the enemy positions. Mohammed bin Salman’s rise to power and fame indicates a looming inheritance problem in Saudi Arabia. The succession in the monarchy is governed by so-called agnatic seniority, when the throne goes from a monarch to his younger brother rather than the elder son. King Salman is the last but one son of King Abdulaziz, the founder of modern Saudi Arabia. He is 79, while Crown Prince Muqrin is 69. With them both dying, the royal power is bound to go to the second generation of Saudi princes, and there is no certainty that the transition would go smoothly and would not descend into yet another Game of Thrones-style war that Saudi Arabia saw in the past. The official deputy Crown Prince is Muhammad bin Nayef, the current interior minister. 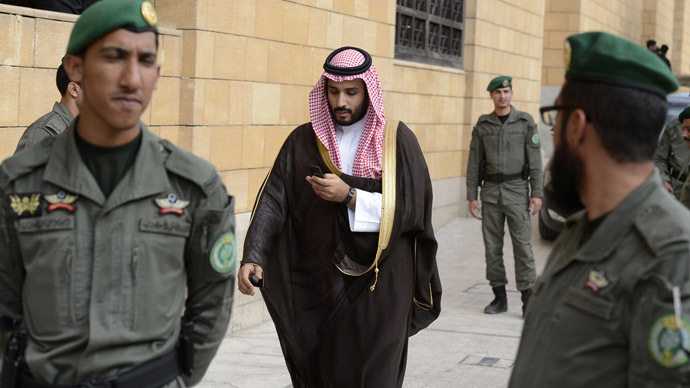 The young Mohammed bin Salman and 63-year-old Mutaib bin Abdullah, who head the army and the powerful Saudi National Guard, respectively, are considered likely contenders for the throne. In theory, the succession has to be established by the Allegiance Council, a 28-member body established by then-King Abdullah for the purpose. Their decision should rely on a candidate’s experience, tribal affiliations through his mother, his standing in the Arab world and popularity among Saudis. In practice, King Salman’s succession was reportedly the result of an unsuccessful palace conspiracy. The bombing campaign in Yemen has so far been limited in success, with the Houthis advancing on the loyalists despite Saudi intervention. The airstrikes so far killed at least 540 people in Yemen, including 74 children, according to World Health Organization. Aid organizations such as the International Committee of the Red Cross warn that the poorest Arab nation is facing a major humanitarian disaster due to the continued clashes. “If they keep up a naval blockade along with the bombing then this humanitarian crisis is going to explode. The question is how draconian they will be in their determination,” author and columnist Chris Hedges told RT. Washington this week announced that it would step up support for Saudi Arabia by speeding up the deliveries of weapons Riyadh purchased in the US and intensifying intelligence sharing with the Saudi military.